History: (Black Goliath#1 (fb) - BTS) - Herbert Bell, Talia Kruma and Dale West were employed by Bill Foster to work for Stark International West in the Savarro Canyon Research and Development Centre in Los Angeles. Foster named them the Whiz Kids. Under Foster's request, the scientists build a personal force-field which had been to be worn by the Police Forces. They worked hard on the project, with some difficulties and some accidents on the work. (Black Goliath#1) - Bill Foster attended a test on the first prototype of the personal force-field device, but the scientists demonstrated that force-field was still unstable. (Black Goliath#2) - A top secret box arrived at the Lab. But the scientists could not open it without the authorization of Tony Stark. Later, the three scientists created a handy device for tracking radiation for Bill Foster. Foster used it to track the radiations emitted by Atom Smasher (Ronald English). (Black Goliath#3) - The Stark West Resarch Centre was attacked by Vulcan and his henchmen. Dale West wore the force-field jacket and distracted the criminals for a while, but they eventually managed to steal the box which contained the Null-Life Bomb. (Black Goliath#4 (fb)) - The three scientists were surprised to hear Foster's plan of abandoning the Centre after a squabble with Tony Stark. 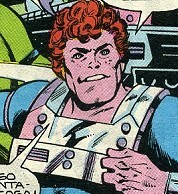 (Marvel Two-in-One#24) - Foster and his assistants created a space suit for the exploration of the surface of Venus. During the test, Hijacker attacked the Centre to steal Stark's prototypes and projects. The criminal gassed the scientists, but was stopped and captured by Thing and Black Goliath. (Marvel Two-in-One#85) - Still at Stark West, the Whiz Kids received the visit of Bill Foster and Ben Grimm. Shortly later the Atom Smasher (Michael English) and his men looted the Stark West warehouse, Ben Grimm tried to stop them but the criminal stunned him. The scientists helped Grimm. 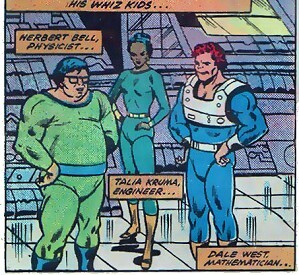 After examining the list of the stolen components, the Whiz Kids guessed that Atom Smasher wanted to build a bomb. Spider Woman gave her blood to cure Bill Foster from his radiation poisoning, the Whiz Kids visited Foster to the hospital, hoping that the scientist would come back to the Stark-West. Comments: Created by Tony Isabella (writer), George Tuska (pencils), Vince Colletta (inks). Mind you considering the surface conditions are something like 600 degrees heat and 90 times the pressure of Earth at sea level even the Thing might find it hard going. or any character with a similar name. The personal force-field device was intended to be used by the forces of Police. The prototype was built as a jacket which produced a force field surrounding the person who wore it. The force field could repel any object flung on it, including bullets. Inverting the polarity, the device could also act on the iron contained in the body of a human being, causing the force field to attract another person. After the field was shut down, it could be regenerated in few seconds. The commands of the field consisted in simple switches on the front of the device. The force field also increased the strength of the wearer. The prototype had a weakness: the field was unstable and could shut suddenly down if touched by an electromagnetic charge. The prototype jacket was destroyed. After the field was hit by a powerful blast from Vulcan it overloaded and reverted his force against Dale West, the wearer, bending and almost crunching him. Bill Foster took the device off and flung it far, before it exploded. The device for tracking radiation had the purpose to find a particular type of radiation, the one emitted by Atom Smasher. It was a little cylinder, as large as a wrist. Touching a button, the device ejected a purple ray which pointed to the location of Atom Smasher. The Venusian Suit was only a prototype of a space suit that would have to be used by a normal man on Venus' surface to let him survive. The prototype suit was still incomplete, it was not strong enough to defend a normal human from the Venus atmosphere. 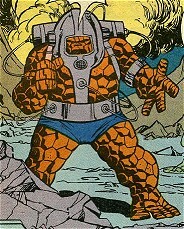 To test the prototype, the suit was worn by the Thing in a simulated Venusian behavior. It resisted and protected the Thing from a pressure of 150 atmosphere, from poisoning exhalations and from very high temperatures.